MONTGOMERY – The Montgomery High School community was shocked and dismayed in 2012 when it discovered an outside wall, where school buses dropped off and picked up students, had been spray-painted with a racial slur. The hate message was particularly offensive because the school is a place where students go out of their way to help others, according to Adam Warshafsky, the school’s arts supervisor, and Tina Dailey, a ceramics instructor. The buildings and grounds crew attempted to remove the paint, with only limited success, so the student council quickly erected a plywood sign painted with the word “Community” to cover up the graffiti remnants. Over time, that plywood began to warp and deteriorate. “I always wanted to cover that spot with a ceramic mosaic, but I knew I didn’t have all the skills to bring it to fruition alone,” Dailey said. She also knew they would need more people to produce the tiles. Six years later, and thanks to the collaborative work of students and a professional artist, the space carries a whole new message. Eventually, Superintendent of Schools Nancy Gartenberg told Warshafsky about the Young Audiences program, and Young Audiences in turn told him about the Artists in Education program. The latter gives grants of $10,000 to schools to pay a professional artist for a residency to collaborate with the faculty and students on a specific project. 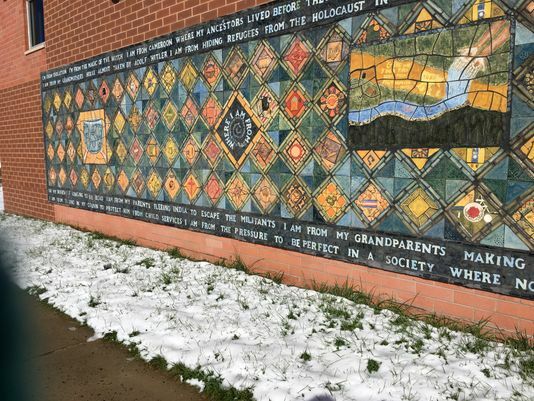 Through Artists in Education, the district was able to bring in Gail Scuderi, a ceramic artist, who could help the school design and install a mosaic to permanently cover the graffiti. The transformative work began in February of this year. 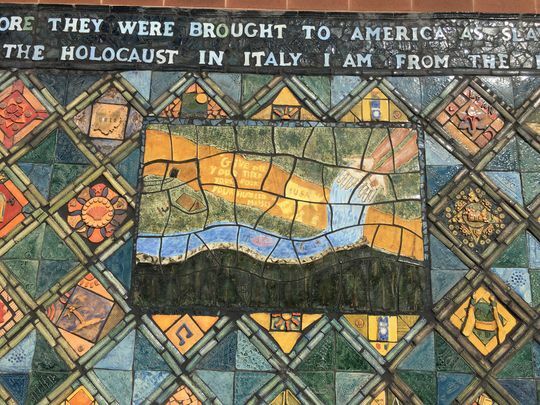 Scuderi felt sure that by telling the world “where I am from” through art, the students would build a strong message of unity through diversity. Some shared where their family came from, but many more shared where their heart is. Every voice was important to create an authentic work of art. Initially, Dailey tapped the 60 students in her three ceramics classes for this mosaic, which Scuderi envisioned as a mural that would be built like a quilt. Its shapes are unified by geometric repetition and through color themes, but every tile is individual in its own message. Each class of high school ceramics students edited their individual poems into a group poem, which is incorporated into the top and bottom of the mural. Then they collaborated on a design for the mural. The students voted on which design they liked best, and the winning design became the overall design for the mural. This collaboration further helped to build a sense of community through the project. The project expanded beyond those students to include a middle school ceramics class, faculty and administrators. Members of the community also got involved during Montgomery’s annual community arts night, making some of the tiles that went between the squares. Dailey pointed out the diversity embraced in the design. She said one student square depicts his family’s work for NASA, another depicts their Christian faith, another is about baseball. But brought together, there is unity in the diversity. “The one comment I heard over and over from students was they couldn’t believe that such beauty could come out of something so ugly, meaning the graffiti,” Dailey said. Assemblyman Roy Frieman (D-16th District) who attended the dedication in June, said the mural is one of the most beautiful things he has ever seen. “I came home from the dedication and told my wife, ‘I have the best job in the world’ to be able to attend things like that,” Frieman said. This entry was posted in Press, Press Articles on November 28, 2018 by Chris.